They were teen heartthrobs – then came trouble. Now they’re housemates on A&E’s new “scripted reality” series The Two Coreys. I would love to hear from someone who actually watched it. Maybe I’m wrong – maybe the show is gold. previous post: Selenite Crystals. Truly Spectacular! next post: Incredible Body Painting By Pashur. WOW Feldman has a kid??????? Zen is his name, amazing!!!!! I have my limits where trash TV is concerned. I put up with Cops and Sylvia Browne Wednesdays on Montel, but I put my foot down where this is concerned. If Chas wants to watch this pre-staged trainwreck, he has to watch it on the bedroom TV. 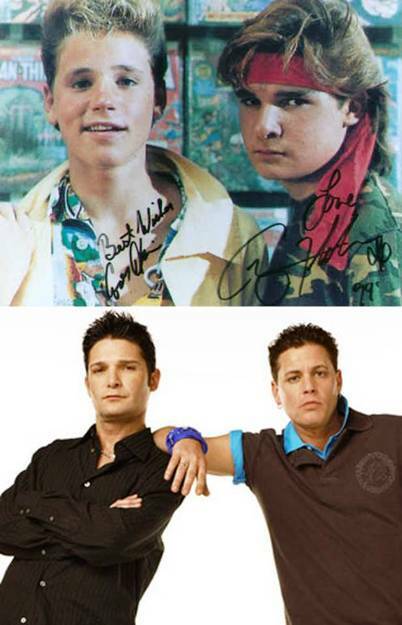 I love The Two Coreys. I watched the show and I think its good to see them on the tv again. Weather in the movies or on tv, it does not matter, I love them. They are great and know matter what i will always be a fan. I ecspecially LOVE COREY HAIM, hes my favorite!!!!!! man that he was suppose to become….